The future CTO of 7 Generation Games with a backpack full of books and iPhone erasers. I would like to say that she has a very refined literary sense and that it went toward purchasing classics like Joyce or Garcia Marquez or Shakespeare. But she’s in second grade, so instead she came home with Disney Channel movie and Mattel show novelizations about the children of storybook villains. (She has made it clear to me that they are two VERY different series – I mean, in one the Evil Queen’s daughter is named Evie; in the other, her name is Raven.) I subscribe to the “at least she’s reading” philosophy. On Tuesday, my husband picked her up and they spent probably another $60 on books for her, her sister and their brother. 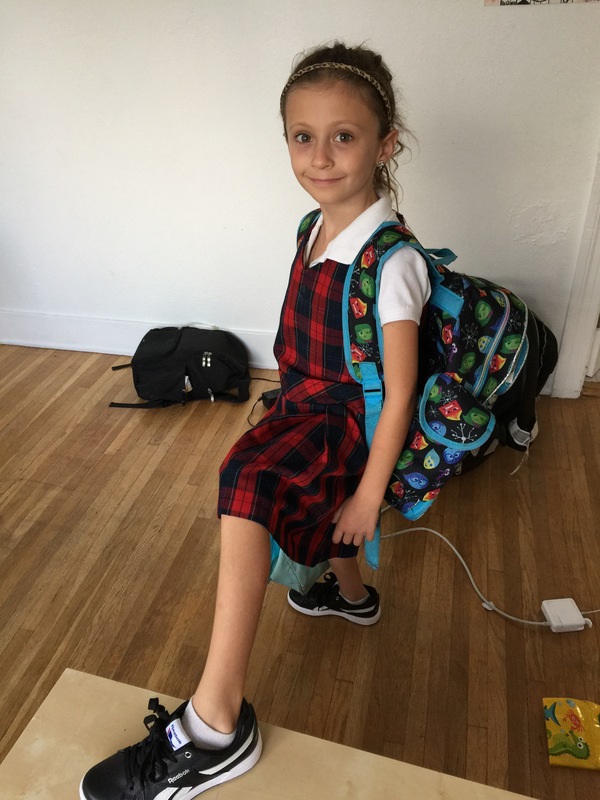 “Almost 8,” she asserted, as she’s been doing since the day she surpassed 7-and-1/2-and-a-day. Which was met by an almost-8-year-old sighing heavily – which I want to think was out of sympathy for the struggles I had to overcome as a teenager without a cell phone in the late 1990s and was not at all because she was annoyed at me for my continued refusal to buy her an iPhone in second grade. This is an ongoing debate as she has saved all money she has received for two years – Christmas, birthday, tooth fairy – to the point where she has the actual cash to pay for an iPhone, forcing us to employ the “yeah, but there’s the monthly service fees” because we never really expected her to save up enough money for an iPhone – and seriously what does she need an iPhone for?! The iPhone debate once again exhausted, Eva turned to her plans to the few remaining book fair items she had yet to purchase. “I’m sorry, a calculator that smells like chocolate?” I asked. “Well, you have money,” I said referring to her iPhone cash stash. I’m not going to lie. 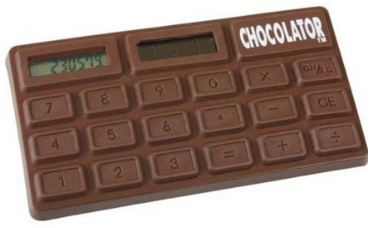 The chocolate smelling calculator piqued my interest. The next day, she walked in the door, carrying a two-foot long rope eraser. “So where’s the calculator?” I asked. She sighed a disappointed sigh. “I couldn’t get it,” she said, shaking her head. Apparently, she had failed to account for the nearly 40-cents that would be levied on her purchase. In the end, 38 cents stood between her and candy-scented number crunching, she informed me. It was a good segue into a lesson on taxes and why we have them, such as to pay for things like streets, firemen, public parks, etc. In other words, it provided a good lesson on not only math, but also civics — which if you’re looking for other ways to teach about math and social studies, have I got some games for you. Now when your kid asks for a calculator for her birthday, you’re basically obligated to buy her one. So I went to Amazon where I found the calculator that cost just over $4 at the book fair. Online it retails for $10.99 – plus sales tax.